Medicare rebates apply for Medicare eligible patients if they are referred by their dental specialist or medical doctor. Medicare rebates do not apply to referrals from general dentists. The procedure is similar to having an OPG. The examination is painless. You will be asked to sit with your chin resting on a small support shelf to provide accurate positioning. 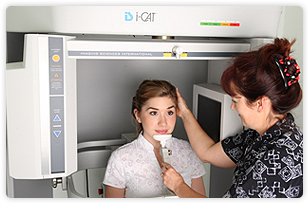 The scanner will move around your head and from this the processer will build and store a three-dimensional image that the radiologist will review and assess.